After a day of work,we've settled in doing our "Nazareth House" thing. 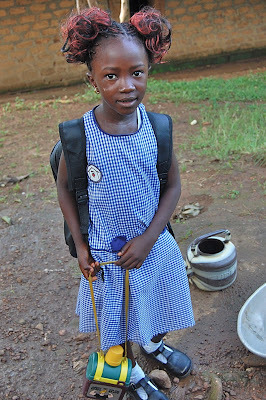 As I type this, James has left to go find some malaria pills - he has come down with a case of it, Kadijah is cooking rice, Ann Marie and Lucy are doing their homework and Father is out walking the streets in prayer. Roo is asleep, taking a much needed nap. He was a bit cranky today. Father S was especially happy to have said his Noon Day prayers at Pa Barrie's home today. Cockroaches make cooking here a lot more difficult. First of all, you must remember that you have to wash the dishes BEFORE you put them in the cabinet and AFTER you take them out! That is to clean any germs the cockroaches have left behind as they invade everything at night. I don't see too many during the day, but get up to go to bathroom at night with your flashlight and ...wow... Even if you eat in the fancy restaurants here in town that can afford pest control, it is still not unusual to see a cockroach run across your table. Cockroaches are everywhere and most of them are the size of '53 buicks! St. Laurence House is probably one the cleanest, if not THE CLEANEST house I've seen around here, and we still get invaded. Morning chores start early with the girls sweeping and mopping the floor before going to school. EVERYDAY! This place is spotless. Every visit, I try to beat Kadijah to the laundry but she always gets to it first. The girls also give her a hand. I put my day's clothes in the hamper at night and wake up to find them sparkling clean on the line. Dirty shoes are washed immediately and propped up behind the refrigerator to dry them from the heat of the motor. No time lost and shoes are ready for use the next day. They have allowed me to cook and I do a lot of it. They love the different flavors I add and different way of cooking. 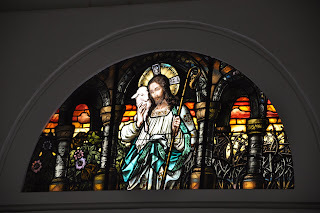 I am sorry if I am spilling out random thoughts on this blog today, but it is very hot, the electricity is off and things I want to tell you are scrambled in my brain. But that is the way Africa is... spontaneous, random. For example, yesterday at the beach as we huddled in the wet thatched cabana waiting for the rain to stop, suddenly James says (totally out of the blue) "Mr. Limpet is dumb, why would any man want to be a fish?" We wanted to treat our staff and those who help them to a day at the beach. A relaxing, fun day of fellowship. We traveled in two cars on some terrible roads, zig zagging around pot holes for over an hour. We get to the beach just in time for a cloud burst! It rains heavy, but we are content, huddled together in a thatched cabana, enjoying each other's company and eating our picnic lunch. It was a good time. Here at St. Laurence House we can stay busy without ever leaving the house. We were delighted to have Marianna and Jaria come visit us today. Together we all sat down and watched the video of Pa Barrie. This was the first time they had seen the video and it made us all cry. Marianna continues to miss her late husband, Pa Barrie and seeing Father Seraphim she said she could only think of Pa Barrie. When she saw Fr. Seraphim praying his beads as he talked with her she could only remember. We go into see Marianna's landlord on Monday and make sure her rent is paid in full. Yesterday, in the city, we briefly saw Marianna at the Central Mosque she works at. We saw our landlord last night, but our inquiries about lengthening the lease or purschasing this current St Laurence House facility met with a negative response. The kind gentleman has memories of this place, he grew up here, raised his kids here. Then he rebuilt the place for his mother but she passed on. He's been renting it to us until his children are grown and ready to move in. That time is now and he will rent it no more after we complete this lease in March 2010. He suggested some institutions that would be fair with us on a house purchase and we will investigate on Monday. James tells me the electricity has been very good but as usual, upon our arrival it has been on and off. Not so bad but sometimes inconvenient. James brother, Paul and his son, Samuel stopped by last night and right in the middle of our visit it was dark. Lyat don go. Fr Seraphim and Paul had a lengthy discussion on the spiritual life while Samuel and Roo enjoyed some good play time. Samuel needs some prayers, he is 5 years old. He has a swollen on his neck, under his ear - I think its mumps but we are not sure. He's been running off and on fevers now for over a year. I have gained over ten pounds since my last visit here and the trim Africans have noticed it well. I have been met with "Mama, you are fat" by everyone I have seen. They don't mean this in a derrogative way as it is taken in America but it does tend to set you a bit off guard when you are greeted this way. To them a "rounded" belly simply means you are in good health and have ate well. Last night, I had to laugh at Paul who greeted me with open arms "Mama you are fat, when you fill your plate you should just fill it half way if you want to remain your same old size" . Johnny, who Fr. Seraphim baptized a few years ago, came by, traveling all the way from to North of Makeni to greet us at St. Laurence House. And yes, he commented that I have "gotten big". Simithe came to visit today. It was a great to see her as she and I have been keeping up on Facebook quite often. We are still looking to see Besty, who is about 8.6 months pregnant! Maybe we see her tomorrow. This afternoon, we handed out the small amount of shoes we had on hand that had been sent to St. Laurence House during the "We GOT FEET" drive that we partnered with One Love Foundation. We only had maybe 8 pairs of shoes, but we found 8 pairs of feet today and covered them in shoes. To be honest, in this neighborhood alone, we could have easily fitted 1000 children in shoes if they would have arrived by now. A great joy for us yesterday, was when Salu, Kadiatu, lil Salma and one month old baby, Marietu visited us. I broke out in tears seeing this baby and the family so healthy and happy. If you remember, it was last year that Kadiatu lost a baby after being in hard labor for days, the hospital (wanting more and more money) neglected to do a c-section and the baby died. Before that, their oldest daughter, Isha, died from infections of severe burn after falling into a cauldron of boiling water. (These stories are on past blog posts). I was anxiously waiting to hear of this baby's safe birth. I could not stand to see Salu, once again taking a baby in a box (no funds for casket) to the grave, and Praise be to God, I didn't have to this time. Marietu is healthy. 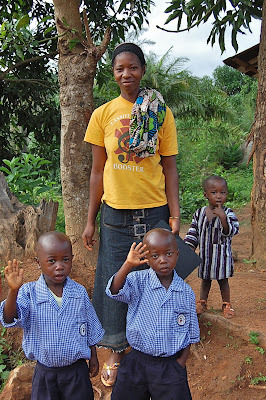 Just a few months before Marietu was born this past September, Kadiatu lost her mother. This is why Salu named the baby girl, Marietu, in memory of Kadiatu's mom. I have never seen a baby look so much like her father. Salu proudly announced "she has my face!" But he need not tell us, we already could see. An affectionate nickname for Salu is "By-Day" because he lives in the moment, taking every moment to its fullest, not worrying about tomorrow or the past, he lives "day by day", hence the name By-Day. I couldn't resist calling lil Marietu "By-Day II". When we fix this java update thing, I promise you'll see the pictures. We use sugar cubes here, in this kind of humidity this works best. My chore this morning was to shake off all the ants and place the cubes into a tupperware container. We have plans to talk with the landlord today. This place is so perfect, tiny but situated well amongs those we serve. We love this neighborhood, in the heart of the poor and would like to stay here. So say a prayer for us, we are going to approach the landlord to see if he might consider selling it to us. It's one of those against all odds things, but hey, you have to ask, right? "Buy Cold Sausage" "Buy Cold Sausage" I am listening to these words as I type this. A merchant is walking down the street, selling his product from off the top of his head. I love it. The icecream man visited St. Laurence House last night. His traveling Ice Cream Shop consisted of a baby stroller equipped with a cooler. Yesterday morning, Fr. Seraphim was sitting on the porch when a lady passed by in a taxi. She saw him and instructed the driver to "stop". She jumped out of the cab and ran to Fr. S. She explained that she saw him and at first wondered "Is he a Muslim or Christian?, then she saw the Cross". She asked questions of him about the spiritual life, eager to learn. As she left she thanked Fr. S for his time, promised to return and said she "felt good" as if she "had been talking with Christ, himself!" I saw a REAL Sierra Leone "diamond" the first night we were here. As we drove to St. Laurence House from the airport, we passed by a woman huddled up against a building. She was crying and as we passed, a tear streaming down her face reflected in the car headlights and the tear glistened like a diamond. I can't get that scene out of my head, the shining tear, sparkling brighter than any diamond I have seen. I wished we could have stopped and helped her but we were in the midst of check point activities and had to stay in the car. Maybe I will find her. I hope so. James, Kadijah, Lucy, Ann Marie and lil' Roo all look well but thin. James is especially thin as is Ann Marie. We took them to a little Chinese Restaurant last night along the beach. It's food is alright, nothing great, nothing terrible. It just is. The building is basically a garage. The large doors are opened and you sit as if you were in a garage with the doors opened. It has awnings, etc and the ocean is right across the street. We were entertained by the security guard who was chasing a rat with a rock. He'd throw the stone at the rat, he'd miss and the rat would scurry away. (Note the rat was not in the restaurant - which was very clean - but outside under the awnings). In the mornings before school the children come to Fr. Seraphim for a blessing. 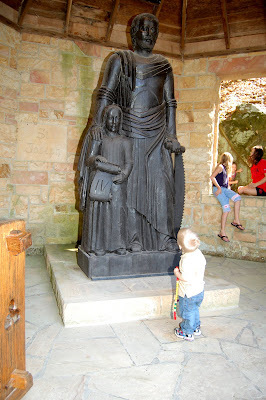 Not only those of St. Laurence House but the neighboring children as well. 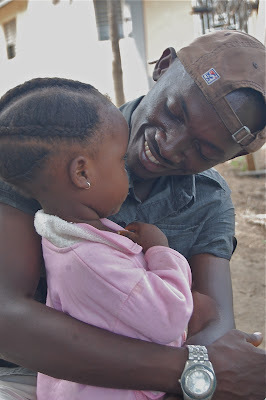 This morning Sanu brought his daughter, Adama. I was happy to see that she was wearing some of the shoes that we sent from the Shoe Drive that Maria had orchestrated. 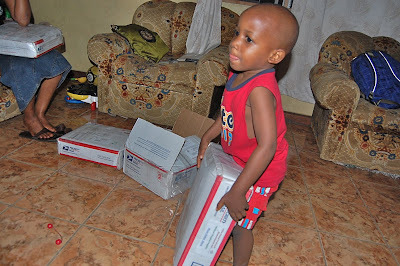 A few of the shoes were sent by mistake to NHA and we used them as packing material for some of the medical supplies. Maria informs me that the container has set sail and should arrive in Freetown on November 17th. We've been told that the drive gathered about 3000 shoes. I am aware that many of you supported this project and although I don't know exactly who all gave, NHA is very appreciative of your cooperation with One Love on this venture. Today promises to be a Steamy one, hot and humid. We've already been to the post and collected 3 boxes, all filled with supplies for Kroo Bay. The postal workers were so glad to see us. WOW! We can feel the prayers, keep them up, this certainly has been the smoothest travel to Freetown we've ever had! Definitely, there must be more people praying us through because we're seeing the response. Praise be to God. 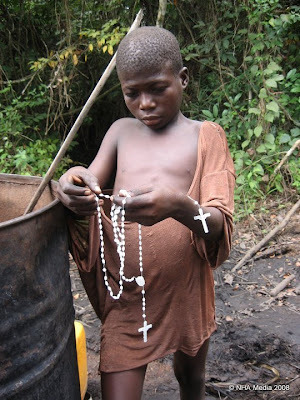 We keep telling you guys - it is prayer that brought us to Sierra Leone from day one, it is prayer from which Nazareth House Apostolate was created and it is prayer that will carry it through and beyond. The flight over was uneventful except that it was very easy. Unusual and quite a surprise for us - normal for us is one distraction, interruption, problem after another on these trips. Neither of us slept, and having left Louisville under conditions without sleep for days, I must admit we are very tired. However, we are well and very happy to be here. As is are usual custom, last minute we changed all travel plans and told James to meet us at Lungi at the airport. It was our plan to stay in Lungi overnight with James and then take the ferry home to Freetown on Thursday (today) during daylight. But Africa is Africa and well laid plans... well... you've heard the story. Poor James spent all day at the Ferry Port of Freetown trying to get on the Ferry which delayed and delayed travel to Lungi. James started at 11 AM Wednesday to make his way to Lungi. As it was, we beat him there - traveling faster from London then he did cross bay in Freetown. James hearing news that we had landed as he was still on the ferry crossing the bay, called his cousin Lt. James Brima Koroma to meet us at the airport. Much to our surprise, he escorted through customs with VIP treatment and cleared baggage without out any hesitation. Then escorted us out to the curb to wait for James who was just pulling up as we exited the airport. Perfect timing, smooth sailing. Awesome! On the Ferry, a young man noticed Fr. 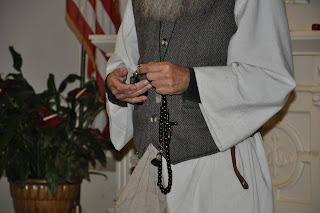 Seraphim's prayer beads and asked him about them. Fr. 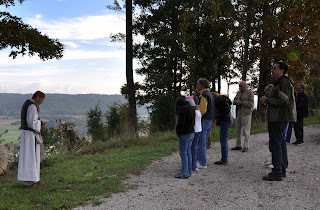 Seraphim explained their use and taught him the Jesus Prayer. Then a woman asked the young man what Fr. Seraphim had said to him. This man taught the Jesus Prayer and the use of the beads to the lady perfectly, word for word. It is so good to be in a place where there is interest to learn and receive. Thanks be to God. We told you about the recent Armed Robberies and because of this the SL Police and SL Army have set up MANY road blocks. We hit them all, AK47 in hand, the police investigated every car passing. Fortunately, we were quickly granted permission to continue at all stops. At one road block it seemed that things may not go so good, but just as the policeman was trying to show authority, a higher up security person recognized James and motioned us on through. James smiled as we passed through and said "It is good that we at Nazareth House give things to the poor, people like us and let us pass". Finally we made it to St. Laurence House and were first greeted by Simba, the Naz House crazy dingo. He greeted us well and allowed us entrance through the gate. Next, finally we were all united - Lucy, Ann Marie & Roo all were awakened to greet us (they had been in bed sleeping since they must leave so early for school in the morning) and of course, dear sweet Kadijah was there with her giant smile and loving heart. Oh my gosh, it is good to be here. I've missed our family so much. They are not simply staff to us or to you, they are our family! The night was a normal Freetown Night, rioting noises from the street, demon-possessed dogs screaming all night...ahhhh the night sounds of Freetown. Early this morning, Fr. Seraphim and I finally fell asleep just as the neighbor began sweeping and washing her steps and preparing her fire the days' cooking. Then it was time for her to shout at her kids to move faster as they were getting ready for school. I think we will forget sleep, that will come ...for now we are in Freetown... much more things to do. Oh yes, and I've had my first cold shower and yes... it shocked me again... don't think I will ever get used to not having hot water in a shower, but I will deal with it. More soon. Love to you all. James' brother Mako is in serious pain in Kabala. 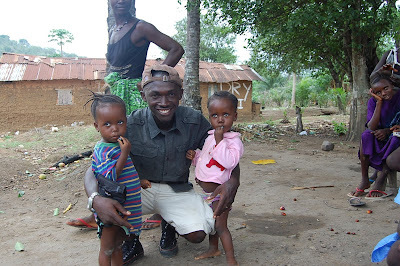 James is in process of trying to see him through to Freetown for diagnosis and assistance. Please keep him in your prayers. 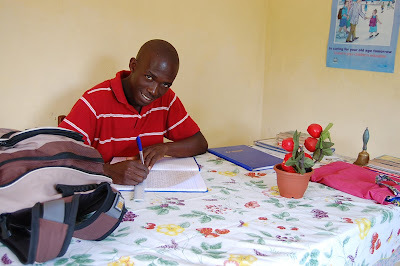 Mako, runs the coordination of teaching, teachers, etc of our school in Kabala and also does all the administration work. He is an outstanding man, very capable (traits that run in the Mansaray family). 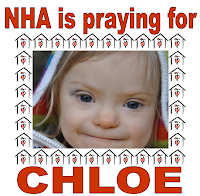 Your prayers are not just another request, they are the wings and life behind NHA. It was prayer that brought us to Sierra Leone and it is that prayer that will continue us. 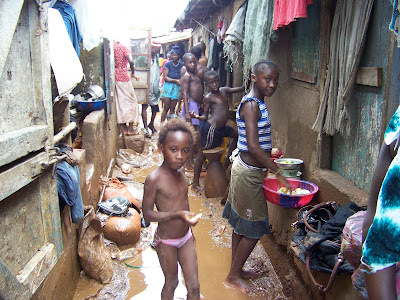 In a very short time, A Nazareth House Mission will be in the works on Sierra Leone soil. Every time we schedule this trip, all havoc breaks loose and it seems that it will never be possible. But thanks to your prayers, your compassion, your love and support - against all odds, another mission is about to take place. Praise be to God. The words "Praise be to God" brings tears to my eyes, not only for what it means and the joy within but also because it brings to heart our dear friend, Pa Amadu Barrie. His favorite prayer was "praise to God". This Mission is dedicated to him, in honor of his life, in honor of his prayer. This will be the first visit to Sierra Leone since he dropped the body last October 12th. We will miss seeing him but know he is with us in heart. My usual brain numbness has set in as I am on auto-focus, concentrating only what needs to be done before we leave. Strategic plans, packing, flight confirmations... etc. etc. All this must be done in prayer, for without it - we are just handing out supplies. 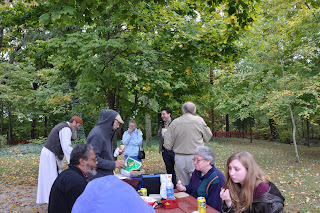 It is the prayer that directs the life into our work, that builds the bonds of love, transcends the darkness and makes our work a service to those in need and not simply an organizational distribution. 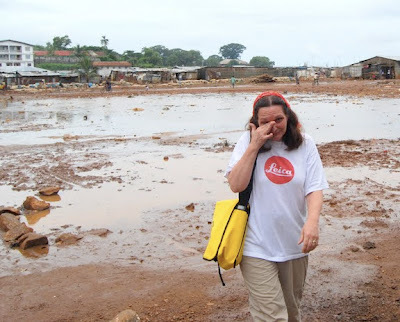 Nazareth House is honored to be in Sierra Leone, it is honored to walk with its people. We are also most honored to have a group of people as you. An awesome, caring bunch. Thank you. The supporters of Nazareth House Apostolate ARE Nazareth House. You make it what it is. I have no way of previewing to you what this trip will entail. We live in the moment, that is all we have. The past is gone, the future not here yet. Each moment will unfold as it unfolds, the comfort being that GOD IS IN IT. We will do our best to keep this blog going from over there, in the meantime remember to keep us all in your prayers. God bless you. "There shall be an holy convocation"
Nazareth House Apostolate offers "A Holy Rosary Convocation" each year on the Thursday, Friday and Saturday nearest to the Feast of the Holy Rosary (7th October). which is held on the Saturday of the Convocation week. 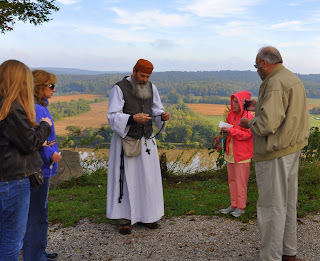 Nazareth House Apostolate Passports are stamped at each stop on the Pilgrimage journey. Prior to the Convocation, booklets were handed out with October Intentions (prayer intentions for each day of the month of October). May I relinquish the old self and embrace the new self. Eph. 4:22-24; Col. 3:9-10. May I let go, let God and let be.Prov. 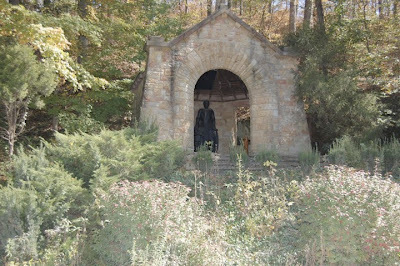 3:5,6.
we travel to say each set of mysteries of the Rosary at a different specific destination. 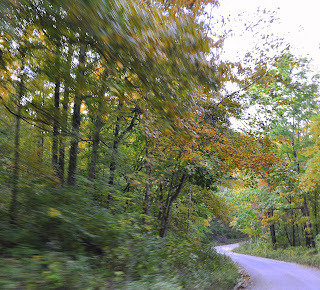 The Autumn air, the turning of the Fall leaves, it is a beautiful route to the area shrines. The picnic grounds of Monte Cassino are perfect. 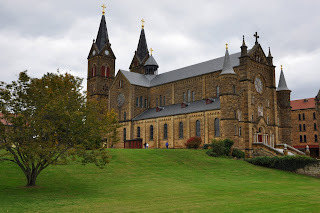 After Lunch we travel on to St. Meinrad Archabbey of St. Meinrad, Indiana. We say the final set of mysteries there. A quick visit to the gift shop and we journey back home. A day spent in prayer and fellowship. Perfect! This year "the Sixth Decade" was given: (i.e.) 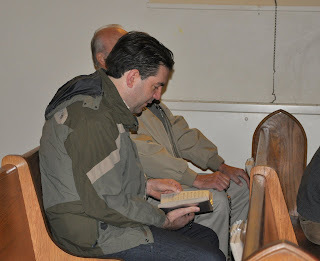 an additional decade prayed on the rosary for a special intention using an appropriate episode from the Life of Christ. For example: We are in prayer for a little 2 year old girl with leukemia named Chloe. We use the mystery of the Lady with the blood disorder (since Leukemia is a blood disorder). This story is also known as the "Woman with the Issue of blood" -Pushing through the crowd to touch His garment to receive healing. 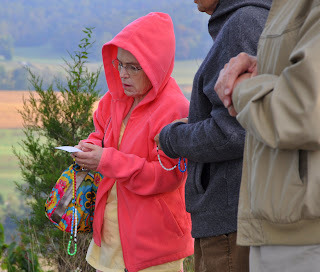 Click on the following link to see photos and videos of the Rosary Pilgrimage. The slide show option is the better form of viewing. 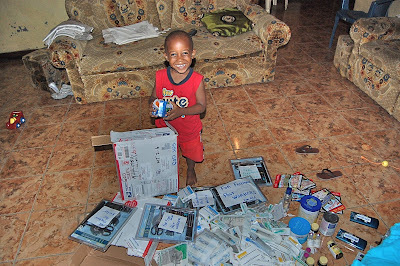 Nazareth House Apostolate appreciates the timely delivery of our care packages that contain much needed supplies for hospitals and clinics in Sierra Leone. 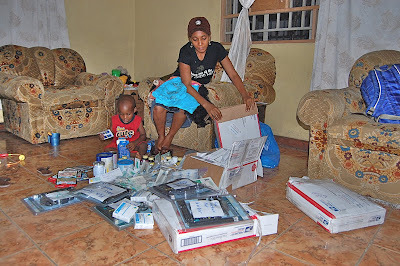 In appreciation, from time to time, we send and will continue to send over-the-counter medications and other helps specifically to the postal workers in Freetown who are working hard to see that our packages get to St. Laurence House. Thanks for your honesty and thanks for making sure those in your country who are in need get the supplies intended for them. We will remember you, thank you. Funds came in yesterday, pushing us further to our goal. Friday 16th of October is the final day to receive funds. We must make (and/or break) our goal by midnight. I know we will do it. I feel like Jerry Lewis in one of his MS fund raising shows... rising to the last minute. The Matching Challenge has been met and matched. Thank you. LAST Minute CHALLENGE TO help us make our goal. Beginning this morning, Thursday, October 15th, a donor has pledged to match up to $500 for any donation made through paypal on our website on or before October 16th! Lets get working! If you give $25 right now through the website, that person will give $25 also - your donation will have doubled. So instead of raising $500 we will have raised $1000. you will be glad you did, you'll feel good about the difference you make in the lives of those less fortunate than you! with some vitamin A for helpless village kids! 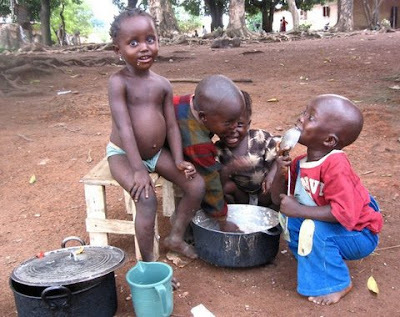 These kids lack vitamin A and need it for their sight. This is a good thing these things arrived for the up coming visit of Fr. Seraphim and Mama Vicki. So much has been asked as we are running out of time to reach our goal. Please give today and be a part of this great work of yours. We at St. Laurence House here in Freetown are totally empty! We have no resources to give out to these people in need. We have given all that we have out. But we rely on you all as you've been doing before in the past. I wish I could type down names of all those who had contributed generously all these years, but you know who you are, God knows who you are and that is all that matters - except maybe I also know it matters a big deal to the people who are hungry, sick and in need. Let's not have them go without. when there is nothing left to give and hands still being outstretched. We can prevent this. No way we can fix all the needs, but there is a way we can spread the help to many. Time is running out, please GIVE TODAY. We are getting closer and closer to our deadline this Friday. 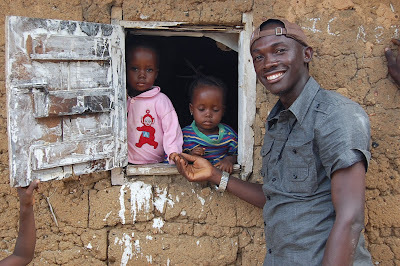 That is the day we must have all the funds raised in order to meet our goal of $7,500 for the on-the-ground needs that we happen upon as we travel through Sierra Leone. What if we run into a small child needing desperately to see a doctor, but we have no fees to get him in to see the physician? OR... what if we are buying rice and distributing it, but we run out and many children are left standing with empty cups .... or we find a family with water dripping on them all night through a leaky roof... will we be able to fix the roof? Please help us meet these needs, give today! Today is a holiday for Nazareth House Apostolate. It is the one year anniversary of Pa Amadu Barrie's transcendence from this life. He is a man who dedicated his whole life to prayer and fasting. A most holy and honorable man We love him and miss him dearly. 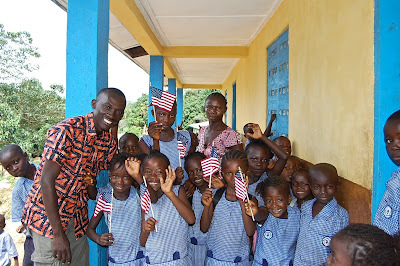 for the students of NHA School in Kabala, Sierra Leone. 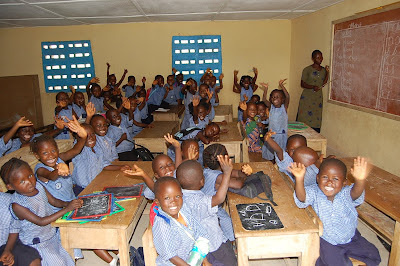 The school continues to excel thanks to your support, prayers and love. In other news, James is recovering from what appears to be a neck injury that has caused him to lose feeling and control of his left hand and arm. A friend of ours, a priest in the Anglican community, Fr. John Slavin, gave some medical advice to James and suggested treatment for James. James, waited 2 days to be given an appointment with a doctor in Sierra Leone and 10 hours in the waiting room when he came to doctor at the time of his appointment. And we say healthcare in America is bad! The doctor confirmed the diagnosis that Fr. John had given. James is adhering to treatment. 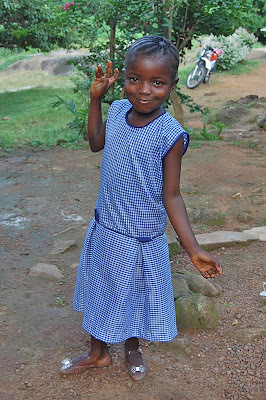 Our trip to Sierra Leone is pushing closer. We've already began our malaria preventative treatments, everything is set to go...BUT we have yet to make the financial goal of $7,500. We are still running just at $3,000 behind. USPS mail can be slow, if you are mailing in your tax deductible donation please do so quickly. The deadline is October 16th. You will want to be a part of the is mission, making a difference to so many lives. You may also give through the paypal donation link on our website. The paypal box is prefilled with the figure of $25 but you can give however much you want, just change the number. Paypal donation must also be in before or on October 16th in order to process it for the trip. Thanks again for all your prayers, love and support. Urgent Prayer Request: James is experiencing pain with numbness in left hand. This is now in 3rd day. 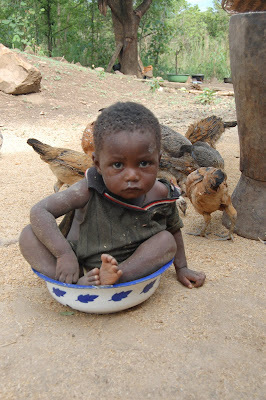 He cannot see a doctor until Monday due to situation in Freetown. Please pray. Please keep the donations coming in we are down to a few short weeks and still fall short of our goal. Donations can be made through the website at this link (see the paypal donation button on the right side tool bar) or by mail to NHA, 2216 Goldsmith Lane, Louisville, KY 40218. 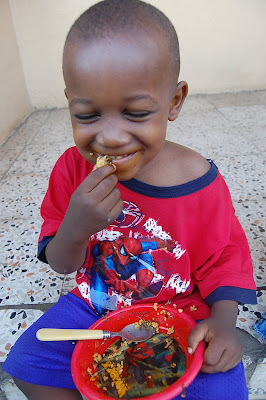 Yesterday, Laurence Thomas Mansaray aka Lil Roo (affectionately known as ROO HOO by Mama Vicki) was 3 years old. Today his family will celebrate this milestone with a picnic at the beach. We ask for your prayers in the following situations. Keep James in Freetown in your prayers, his left arm has become somewhat numb with burning sensations in the fingertips along with involuntary twitching of the fingers. Since there are no other symptoms for more serious conditions, we are assuming he has some nerve damage. Little Chloe of Athens Georgia, 2 years old, begins chemotherapy for Leukemia on Monday. This will be an extended ordeal lasting up to 6 months. Please keep Chloe and her family in your prayers. 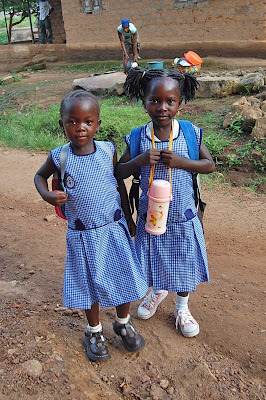 The upcoming mission trip to Sierra Leone is fast approaching this month. Your prayers are the wings of such a project.